Now that school is out, are you wondering how you can get your kids to read during the summer? More importantly, are you wondering how you can get your child to actually enjoy reading so that they develop a love of reading that rivals your own? You've probably heard some of the more popular ideas—create a summer reading list, make mandatory reading time, or limit your children's access to digital electronics, etc.—to encourage reading. However, I believe that these types of tactics can actually teach your kid to view reading as a chore or a punishment and can be detrimental in the long run. 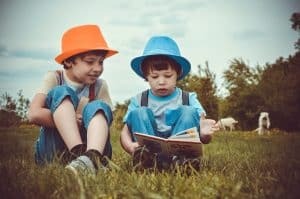 The trick is to encourage your child to read by showing them how much fun reading can be so that it becomes an activity they choose to do without being coerced into it. For younger kids that can't read yet, or can't read well, it's great to spend some time reading together. While reading together, you can share your enjoyment of the story while helping them develop the comprehension skills needed to enjoy books on their own after their reading skills are more developed. It's never a bad thing to read to your kids, even after they can read on their own. Kids who are read to even after they can read on their own are more likely to continue to enjoy reading as they get older. For kids who can read for themselves, but may not be motivated to read on their own, reading aloud to them may be a great way to get them jump started on a book. It will give them a taste for the story and hopefully they will want to continue the story on their own. Read the first few chapters with your child and then ask them to finish on their own. Or, read until an exciting point in a chapter, and then tell them you have another commitment, but that they can finish the chapter on their own. You may even find that your child has read a few more chapters than expected because he or she couldn't wait to see what would happen next. Reading books targeted at kids may not be your preferred reading material, but reading books alongside your kids that they enjoy, acting excited, and sharing your thoughts on their books will really help encourage your child's reading habit. Think about how excited you are to talk about your favorite books with your friends. It's the same with kids, but they're probably even more excited to share the experience with their parents. Plus, reading with your child can help motivate your children to read more. Are you ahead of your child in the book? Hint that they're really going to like what happens in the next couple of chapters and you can't wait to talk to them about it. Schools are already teaching kids to view reading as a chore, and no one likes chores. The trick as a parent is to get your children to look past this mindset and learn to view reading as a fun past-time. While setting daily reading limits and withholding playtime or other fun activities until they're done is a popular method for getting children to read, I feel this may actually cause more harm than good. Instead, encourage your children to read every day, but don't set a required limit and don't withhold other fun things from your kids if they don't meet a requirement. You don't want them to view reading as the enemy, and even the best readers take days off from reading sometimes. Lots of places, including your public library, your child's school, and Scholastic, to name a few, put out summer reading lists every year. However, some reading lists focus too much on educational materials or books that meet academic needs—in other words, they're not always fun. Creating your own summer reading list of books you know your kids will be excited about, or letting them create their own TBR list, is a great way to go about creating a summer reading list. We've all had a friend suggest a book that they loved, but no matter how much they talk about it, we just couldn't bring ourselves to read it. While some kids look to their parents for guidance, others like to venture out on their own. Giving kids more control over what they read can make all the difference. Often times, summer reading lists go hand-in-hand with incentive programs. However, a certificate or small knickknack may not be enough to incentivize your child to carry through with it. So, think about something your child would actually want to work toward and create your own reward system. As a word of warning, though, don't make reading ONLY about the reward. If you focus too much on the reward and less on enjoying the process of reading, kids may stop enjoying reading once the rewards stop coming. Using this tip in combination with some of our other tips is the best strategy. As your kids grow up, they will most likely try to find their own independence and a part of that usually means that mom's and dad's advice is no longer cool. So, if your child is constantly ignoring your book suggestions and is starting to read less, perhaps leaving out a few books that you know will tempt them can help them pick up a book without feeling like you told them to do so. This is especially effective if you leave books in places where your kids will tend to get bored; leave a basket of books in your car or in the bathroom. Or, if you know you're taking your kid somewhere where you'll have a long wait, conveniently pack a book that they may find interesting so you can hand it to them when they complain of boredom. You know your kid isn't going anywhere without his or her phone, tablet, or iPod (whatever device they carry around), so teach them that they'll never be anywhere without a book either. And maybe, just maybe, the next time they're sitting around bored and they've already checked social media, they might just open up their ereader and read for a while. Try as hard as we might to pick up books we think our kids will love, sometime it's hard to find that special book that will spark their interest. So, take your child to the bookstore or library where the possibilities are endless and let them pick for themselves. And if your child doesn't want to go to the bookstore or library? Tell them you're not going there for them, but that you're going for you, and the most convenient time for you to go is during a time when they're already out with you. Limiting your child's digital time won't necessarily have your child running to books. They may instead opt to go outside and ride their bike, draw, hang out with friends, or take a nap. However, there are times and places where, without digital devices, they will have few options but to read. For example, car rides. If you're going on a trip in the car, don't provide a DVD player for your kids to watch and advise them to save their phone batteries for when they actual get there. Without digital devices, reading becomes pretty much the next best thing you can do in a car. Bed time is another great time to limited screen time. Tell them you'll be taking their devices at a set time every evening to help your kids sleep (there are lots of studies to back you up here) and that if they want to stay up later than that, then they're welcome to grab a book. The best way to teach is by example. So, if we want our kids to read, we should show them that we love to read too. For some, this may mean giving up your quiet reading spot away from all the noise for a slightly louder reading spot in the family room. Or that you read a little more in the daytime rather than at night when everyone is in bed. This may mean opening yourself up for some distractions while you read, but you should be happy to welcome these distractions, especially if it's a curious child asking what you're reading. Kids mimic what they see, and you may just notice your kids picking up books more often as they start to see you read more. If your child has only been reading for class, they may think that reading means structure, boring old classics, critical thinking, and reporting back once they're done. Teach your kids that pleasure reading is nothing like this. Teach them that pleasure reading can mean graphic novels and popular fiction. That pleasure readers can skip around the book, skim boring parts, and even peek at the ending. Teach kids that they don't have to finish books that don't interest them—they can drop them and move on to another story. This seems like common sense, but you might be surprised by how your child perceives reading. Organizing your books by interest can help your child know which books to pick up next once they've finished one they like. To do this, go through your books and group books with similar plots and story elements together. That way, each story will be surrounded by books similar to them, so if you child makes their way down the shelf, they'll continue finding stories they love. Whether you're going to the beach, the doctor's office, or grandma's house, make sure you have a book on hand, not just for yourself, but also for your kids. Kids aren't always the best at packing for themselves, but by always having a book on hand for them, you'll make sure you're not missing out on any reading opportunities, and your kid won't be able to keep telling you they're bored. It's a win-win! Odds are, the television shows and movies that your child loves are based on books. So pick up a copy of that book the next time you're out. Your child already knows they're going to love the story, and they'll love learning the extra details from the book that were overlooked by the movie. Plus, if your child is struggling with reading, reading a book about a story they already know will make it super easy for them to comprehend the book. There is a huge group of adults who still love reading books targeted toward "young adults." So if adults are reading books below their technical reading level, why get caught up on if your child is reading books meant for fourth graders instead of fifth graders? As long as they are reading and enjoying it, does anything else matter? What other tips do you have to help your children develop a love of summer reading? Let us know in the comments below! Do you have a blog idea or topic you know our readers would love? Contact sarah@mybookcave.com to learn how you could get your blog featured. i think encouraging children to read aloud stories they enjoy to their siblings or friends also helps them enjoy reading and maybe taking turns to read a book or a chapter to one another in turns also helps!! My daughter and I take walks to the Free Little Libraries scattered around our town. We love looking through all the books to see if we can find any that sparks an interest. I am always surprised at the books my daughter chooses. We then take the books back after we have read them or take another book we longer are interested in. My daughter is always excited to read her finds and when we get home we curl up together and dig into our great new finds. I know these are moments I will always treasure. For years I had been encouraging the kids in my class to read books I had heard were great, reading aloud the blurbs in back and asking who wanted them. (No one). In fact, banned book lists can be a great resource for parents looking for books that teach kids about the world and themselves.